Dubai has a rich cultural heritage that extends across the Arabian empire. The country’s name alone will bring to mind homes with luxurious fabrics and over-to-top ornamental features fit for a king. 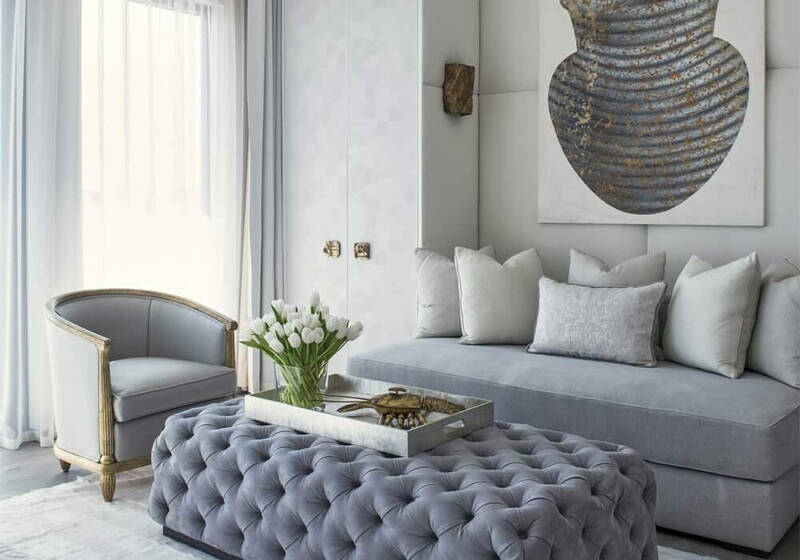 However, there is a movement among the Dubai’s elite towards a more western style, as it has become much more desirable than the traditional décor that is so unanimous with the country. This can be seen reaching its full potential in the exclusive Arabian Ranches community, which sits in an idyllic location in the middle of the desert. The villas back on to a private golf course and are screened from neighbours with mature foliage, providing the privacy their affluent occupants require. At first sight, you’d be mistaken for thinking that they are normal homes with unassuming exteriors that wouldn’t look of place in suburban America. Even stepping inside their layout is surprisingly pedestrian with many small rooms featuring natural wood pine shutters that make the interior spaces feel dark and underwhelming. It’s no wonder then that their occupants are deciding to take advantage of the services of foreign designers based in London, Paris and New York, to name a few. 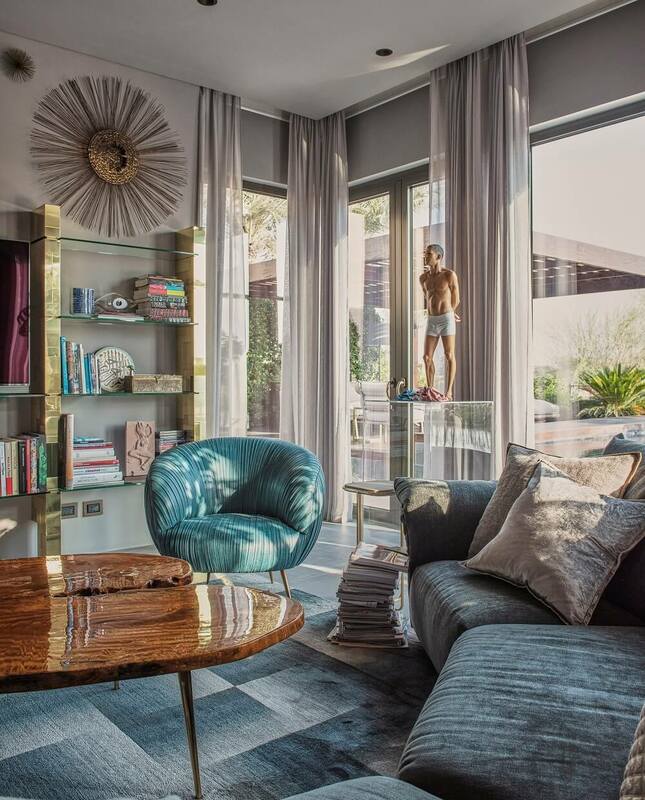 An outstanding example of the work that is being done comes from London-based interior designer Michael Reeves, who recently refurbished a villa in the Arabian Ranches community. Michael Reeves was asked to completely redesign this villa in one of the best locations in the Arabian Ranches. It started off looking exactly like every other villa in the community – dark, underwhelming and filled with unnecessary small rooms that sucked up the interior space. However, it quickly became apparent that almost all of the interior walls on the ground floor could be removed to provide a singular vast open space. The villa immediately took on a new complexion and it was revealed than several hundred millimetres of the ceiling space was lost to a dated air-conditioning duct system. With these changes made, Michael was looking at a completely differently proposition. The entire back of the house was extended outwards by almost 1.5 metres of glazed French doors and windows were removed in favour of double French doors. This was achieved with only minimal structural support being added to a colonnade of pillars. The new open space allowed Michael to achieve an organic flow between all the rooms on the ground floor, which was previously impossible. Wide square openings were made between the remaining areas, allowing the dining room and kitchen to flow easily from the main living area. Additionally, recessed double pocket doors with metal mesh sandwiched between glass sheets were fitted to provide provide privacy when needed between the kitchen and dining areas. 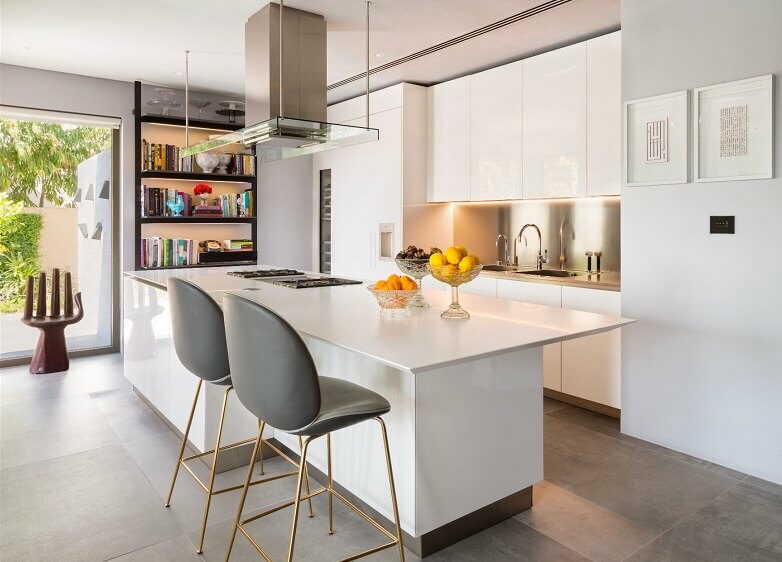 The kitchen area was fitted with a kitchen from iconic Italian designers Boffi, in white lacquer with white Corian surfaces and an area of storage cupboards in greyed walnut veneer. 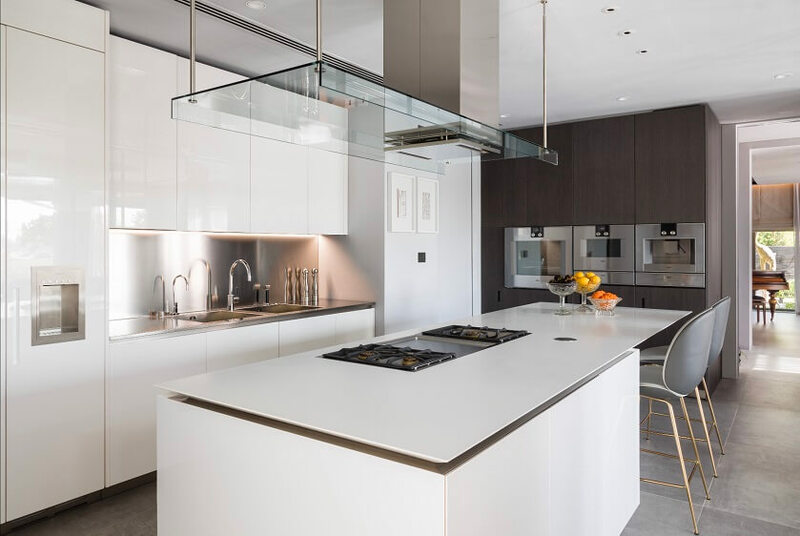 Minimalism was considered in the design process to provide a luxurious feel to the kitchen. As a result, there are no visible handles throughout the kitchen and all surfaces are kept as unadorned as possible. The dining room centres around an oval dining table from Chelsea-based designers Porta Romana, with a camel back, curved dining sofa and “lollipop” back dining chairs in assorted blue fabrics from New York-based Holland and Sherry. A vintage 1970’s brass, Paul Evans credenza dominates one wall with a huge circular glit wood mirror from New York-based Arteriors above. The ceiling has an oval recessed tray area to accommodate an oval glass chandelier with Murano glass. In addition, semi-sheer draperies are used to diffuse the sunlight. The first area features a floor to ceiling library designed with Poliform that dominates one end of the space, in a dark taupe veneer, integrating two Perspex display boxes and a small desk. The ceiling is adorned by a row of angled bronze light fixtures that illuminate the books below. It also features a circular rug, custom made by London-based designer Deidre Dyson, which anchors a pair of indigo linen upholstered daybeds designed by Michael Reeves. These feature matching indigo silk pillows from German designer Sahco. Faux-suede blinds screen the magnificent French doors, which lead to an eye-catching water feature and cactus in the garden directly outside. The second area features a beautiful antique piano from esteemed French manufacturer Playel. It takes centre stage in the middle living section, while semi-sheer curtains diffuse the strong light. Finally, the main seating area is centred a Deidre Dyson rectangular rug in the same indigo colour as the library rug, tying the two areas together. Over scaled chenille covered seating units face a vintage bookcase, designed by Paul Evans, that, has been adapted to accommodate a large screen TV. A coffee table from Japanese American designer Noguchi, which is offset by a pair of turquoise armchair, wrapped in leather strips from Kelly Wearstler. The ground floor is finished off by motorised by semi-sheer curtains that wrap around the newly extended bay of French windows facing the pool. A huge 1.2 metre square ceramic ‘concrete’ tiles cover the entire floor area and extend to the outdoor areas around the pool at the rear of the property. Outside, the pool runs the entire width of the house, with raised decking platforms and outdoor furniture designed by Barcelona-based Kettal. Additionally, there is a outdoor kitchen for entertaining guests, featuring an integrated refrigerator and a huge motorised “sail” blind that unfurls to shield the dining and seating areas. A lush selection of foliage separates the pool area from the golf course that backs onto the house. An elegant staircase with marble treads sitting in stainless steel “trays” attached to the main spine of the stairs leads up to the upper floor with the balustrades being simple glass slabs. The landing, dressing areas and bedrooms are all united by pale grey stained wood floors. Two large bedrooms with generous en-suite bathrooms greet you at the top of the stairs. A further bathroom finds its home in the very large dressing room, designed by Poliform in a pale grey/taupe laminate and veneer. Each bathroom is faced in a combination of marble and mirrors with patterned mosaic flooring from Sicis, all brought together by soothing tones of white, grey and taupe. The fixtures of the entire second floor are in a pales bronze metal. Recessed sliding doors similar to the one down stairs close off the bedroom on one side and the dressing room on the other. The master bedroom has walls sheathed in white from Spanish designer Gastón y Daniela, adorned by soft furnishings in tones of white and the palest greys. The recess between the storage closets is fitted with a deep divan custom made by Michael Reeves. This is lit by a pair of antique gold leaf metal sconces. Semi-sheer draperies diffuse the bright sunlight from the balcony outside, as well as motorised white satin curtains to obscure the light. 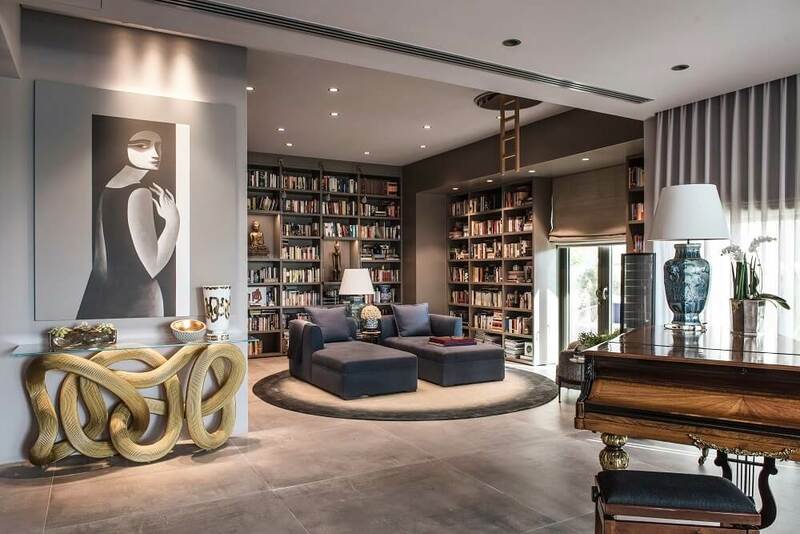 This stunning villa is finished off with major art pieces, featuring a political or social message, and important commissioned pieces of furniture that are displayed throughout as part of the owner’s ever increasing collection. 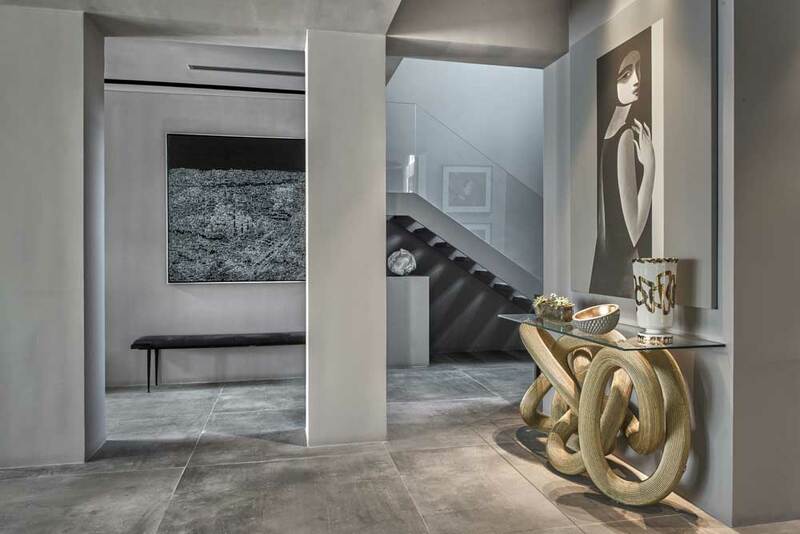 As you can see from the incredible photographs and vivid descriptions of this luxury villa, Dubai’s elite turning to western designers makes a lot of sense. Michael Reeves was able to capture the stunning modern design of Europe and combine it seamlessly with Arabic styling to create the ultimate Arabian Ranch home for its owners.